Dorothy Douse has been a Registered Teacher of White’s Technique since 1978, having studied the Technique with Arthur Hewlett, himself a pupil of E.G. White’s. As a former primary school teacher, Dorothy has considerable experience of using White’s Technique with children. She has served many roles for the Society, including supervising and examining students for their Registered Teacher examinations, and acting as Chairman. She has been Secretary of the EGWS since 1987. Dorothy has been a member of choirs for many years and has also done solo work. 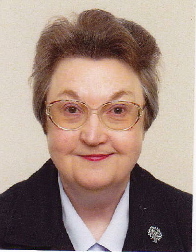 In addition to her work for the Society, Dorothy is actively involved with many other voluntary bodies, as a Primary School Governor, a Trustee both of the Rainbow Centre, an umbrella organisation helping disadvantaged people, and of the East Kent Federation of WIs. It has been in her WI activities as past Federation Chairman and other committee responsibilites that White’s Technique has been especially useful. She can always be heard and understood when addressing an audience even in circumstances where others need to rely on a microphone!